Expo 2020 and the introduction of value-added tax in January 1st, 2018 have brightened the outlook for new hiring in the UAE. The recruitment climate is believed to have standstill, the new changes will turn the employment sector and create new opportunities in accounting and finance segment. "There are some emerging trends that are creating a resurgence in the hiring climate. 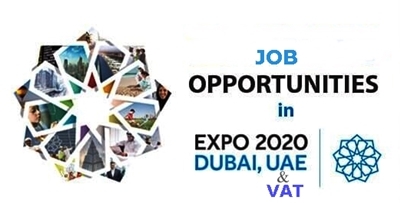 One of these is the build-up to Expo 2020, which is accelerating the outlook for new hiring. Another is the proposed introduction of value added tax [VAT] in 2018 and potential changes to corporate tax that are still in discussion. Both of these initiatives will drive demand for tax specialists and management accountants in the lead-up to their introduction and after, creating a stronger demand for financial professionals who can help organisations deal with the changes new tax regimes will introduce," said Gareth El Mettouri, associate director at Robert Half Middle East. According to Suhail Masri, vice-president of employer solutions at Bayt.com, the hiring forecast shows a continuation of a strong job market in the UAE and the prospect of many more job openings to come. A recent Bayt survey revealed that more than a third - 36 percent - of those planning to hire in the UAE are looking to hire for more than five job roles. The report says most of the demand will be for CFOs, financial controllers/accountants, finance directors/managers, financial planning and analysis specialists in the accounts and finance sector. Those candidates with knowledge and skills of Oracle and SAP systems, effective communications, advanced Excel, MBA, Islamic finance knowledge and ACA qualified will be much in demand. Most of the demand for these jobs will come from pharmaceutical, FMCG, retail, hospitality, construction and boutique investment firms. In the financial services industry, most positions in demand will be institutional sales specialists, wealth/private banking sales professionals, regulatory and compliance officers, anti-money laundry specialists and brokers, according to the Robert Half report. Candidates possessing multinational banking experience, speaking fluent Arabic, existing local client relationship, financial crime and sanctions expertise will be mostly in demand from the financial services companies. In the technology sector, according to Robert Half, the companies will be mainly looking for candidates for the positions of ERP application and functional experts, project managers, business partners, sales director and managers and IT security managers. Candidates having experience of project management infrastructure and application rollouts, new platforms such as the Internet of Things and convergent technologies and user and customer experience will be in demand. In the human resources department, companies will be looking for recruitment specialists, payroll managers, HR officers, senior HR director and learning and development directors. Candidates possessing commercial acumen, knowledge of SAP and Oracle, change and people management, multinational and corporation expertise will be in demand. For legal jobs, the companies will be scouting to fill the posts of senior regional counsel, corporate and commercial lawyers, junior counsel and paralegals. Candidates applying for these posts will have to be Western educated with GCC experience, Arabic drafting expertise and effective English communication skills. In the accounts and finance industry, 89 percent of CFOs predicts that they will either maintain the size of their permanent teams and fill vacated positions (49 percent) or expand by adding new positions (40 percent). Only four percent of companies said that they would reduce their finance teams. Greater demand creates greater competition, and 89 percent of finance leaders report that it is challenging to find skilled professionals today. Almost half (49 percent) say that the shortage is mainly caused by the current lack of niche, technical experts, while 21 percent pin it on a scarcity of commercial and business skills, and 17 percent say that general demand simply outweighs supply. The majority (85 percent) of CFOs are concerned about losing top financial professionals to other job opportunities in the year ahead. On average, employers predict that salaries for accounting and finance professionals will rise by 5.8 percent. Bonus payments are following a similar trend. Only eight percent of CFOs said that they would lower bonuses, compared with 35 percent who said that payments would rise and 45 percent who said that bonuses would remain static. Annual bonuses are being awarded on the basis of personal performance, and they average one to two months' salary. According to Robert Half, the strongest demand is for mid-level finance professionals with five to seven years' experience. The report's findings revealed that new technologies continue to drive demand for skilled IT professionals in the UAE, especially in ERP platforms and mobile. Mid- to senior-level IT professionals are in particular demand and are commanding competitive salaries, it said. Ali Matar, Head of LinkedIn Talent Solutions, Emerging Markets, Middle East & North Africa, said the next wave of digital jobs will be shaped by the 'Essential Eight' technologies: blockchain, 3D printing, drones, virtual reality, augmented reality, the Internet of Things, robotics, and artificial intelligence. "GCC governments can lead by example through championing the digitization of public institutions. GCC governments should partner with technology players, educational institutions, and the corporate sector to boost supply and create demand in the digital job market," Matar said. The Robert Half study predicts that the biggest beneficiary in terms of salary hike in accounting and finance industry will be tax directors, getting 6.5 percent pay hike, followed by FP&A manager at 5.1 percent, financial controller at 4.9 percent, and tax manager 4.7 percent. In the financial services industry, private equity and asset management executives will see 10.5 percent salary hike followed by CFOs at 7.8 percent. In the technology sector, IT managers will see the biggest hike between seven and eight percent increment followed by system managers at 6.5 percent. In the human resources and administration, salaries are projected to rise up to 7.1 percent for the head compensation and benefits department. In the legal sector, salaries of partners, paralegal and legal assistant will see the biggest hike of 7.1 percent, 6.8 percent and 6.7 percent, respectively. According to Bayt's survey, industries that offer the best salary packages included banking and finance (22 percent), aerospace and aviation (14 percent), and engineering/design (12 percent). Bayt.com's Suhail Masri said that although more than half of respondents - 52 percent - to the regional survey were satisfied with their salaries, the majority of respondents to also agreed that the cost of living has been increasing and will continue to do so over the years ahead. This means that they are in need of salaries that reflect the increased costs. At the same time, 39 percent of respondents to Bayt's survey claimed that their loyalty to their company is not linked to the salary they receive.